Prime Italian’s roomy space is complete with subtle brick walls, upscale modern décor and red leather dining chairs. Known for attracting national tastemakers, professional athletes and locals. The Chocolate “Ho Ho” with toasted marshmallow gelato. In a gorgeous home with a sparkling white, wide open kitchen, Casa Tua is designed to make diners feel as they are in the home of a close friend. Try the Risotto with Black Norcia Truffles or Risotto with White Alba Truffles- both favorites of the owner. With a loyal following, this restaurant attracts locals nightly but the food draws in fans from all over the world. Miky’s Chocolate Mousse is very popular. Inspired by the original London location, which was modeled after the first Cipriani in Venice, Italy, it features outdoor, garden-like seating. Beef Tartare with elery and pecorino, a selection from this summer’s all-day menu. For a classic Italian favorite, try the Tiramisu. Cozy and authentic. The combination of good music, food, and a friendly staff makes Macaluso’s feel like home. 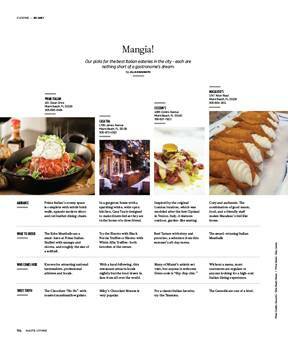 Without a menu, most customers are regulars or anyone looking for a high-end Italian dining experience. The Cannolis are one of a kind.